Should You Have Gold Fever? My first husband bought silver in 1980 because it was on the rise and he thought a good investment. The trouble was, not long after the price was down and stayed that way for years. The only reason he didn’t buy gold at that time was because it was already too expensive. 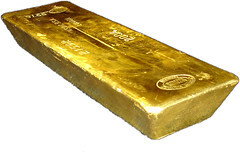 Flash forward to 2010 and gold is selling for nearly $1400 an ounce and has been big all year. If you have gold sitting around not being used, then it’s a great time to sell. Who knows how many years or decades until the next time that old ring is worth so much? There are even house parties where companies price and may buy gold items bought by guests. Instead of leaving house parties with less money than you entered, it’s the opposite for a change. I’m thinking it’s time to go through the jewelry box for non-used items of value. Although unable to predict the future, historic gold and silver prices have dropped as the dollar strengthens. I think prices will be dropping in 2011, especially in the second part of the year. People have been buying gold to offset inflation but the best way to invest is not with bars and coins. Instead invest in a commodity-based mutual fund which includes not only gold but oil, grains, and other metals. Also set a price point at which you’ll divest to keep you from hanging on too long. For example, maybe sell a percentage for every $500 price decrease. Gold and silver have a place in your portfolio. Just make it’s part of a diversified investment strategy; not the whole plan. Has gold or silver been part of your financial strategy recently? A nice, balanced look at investing in gold. I haven’t really considered investing in gold much to this point; besides the sky-high current valuations and a market that seems driven by people’s worst fears (most of which seem to be subsiding), the idea of investing in gold and most other commodities doesn’t appeal much to me. Unlike companies, which can grow their businesses, expand their markets, and create more desirable products, the only way that commodities increase in value is due to someone else wanting them more. So far, I haven’t felt much of a need for gold in my portfolio. Roger, I appreciate your comment since you know more about investing. I’m starting to delve into that world since I’ll have to do something with my money when the bills are paid! Money Reasons, that is really interesting given the size of that population. Do you watch the show “Outsourced”? I’m sure a lot of it isn’t correct, but I find the culture fascinating. I don’t make predictions regarding the financial markets (a person could get wealthy doing the opposite of what I say), but gold seems to be on a slow, steady trajectory. Unlike the bubble booms that topple markets, gold hasn’t exploded, but moved up almost methodically. I’d lean toward Money Reasons on this one–the cultures in the world that have a heavy emphasis on gold are on the rise–we probably shouldn’t bet against that. In fact, it might be that one of the best ways to make money going forward will be to find out what people in China, India and the rest of Asia are buying and follow suit. Kevin, good point. I was basing my thoughts on historical performance and didn’t consider the ever changing global economy. It doesn’t make me feel good when my investments are sold on late night tv. But seriously, I go back and forth on the issue but all I remember is the 2 decades of no gold movement. Evan, I think it’s important to remember those years (and years) where gold prices didn’t change or only went down. I’m not saying no to gold, just gold alone.